The PTX Eco Smart finishing machine from CS Unitec, Inc., Norwalk, CT, offers balanced straight-line handling, high torque and electronic speed control to produce matte, satin and other fine surfaces up to a mirror finish. Use the machine to polish steel, stainless steel and nonferrous metal alloys, as well as to perform coarse grinding jobs such as removing welds, deep scratches, oxidation, rust and paint. A patented abrasive-mounting system promises to minimize changeover time and eliminate vibration. 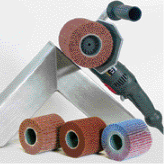 Grinding and polishing wheels can be changed in seconds without the use of tools or hardware. The light-weight hollow-core abrasive wheel simply slides onto the unit’s finned, rigid rubber shaft, and secures itself automatically when the machine turns.